Katie's Premium Jerky & Snacks is a brand owned by Katie's Snack Foods, LLC based out of Hilliard, OH. It was started in 2014 by Katie Levesque, a graduate of The Ohio State University. 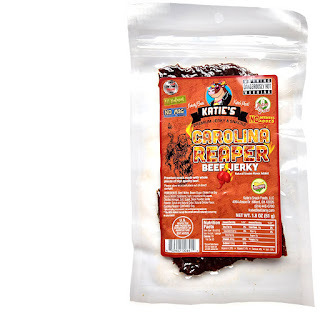 Katie loves jerky so much, that she actually sleeps with it under her pillow (in a plastic bag), and prefers spicy jerky (so that other people won't ask for some). She loves it so much, she left her career as an engineer to launch her own jerky company. 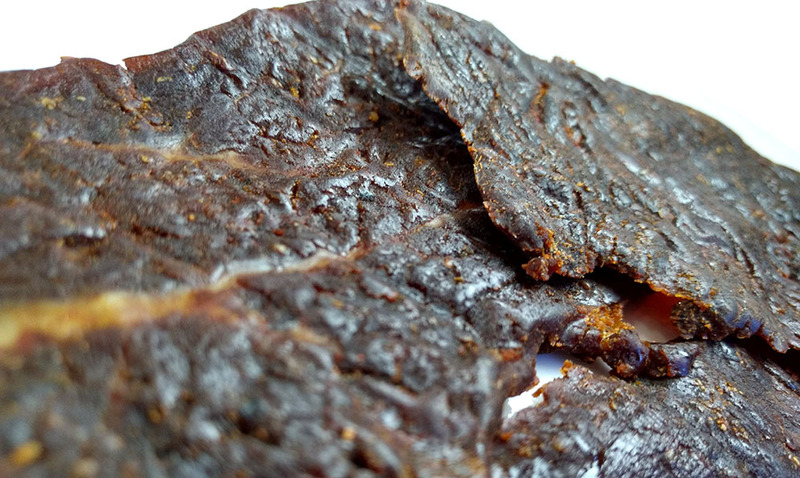 Katie's Premium Jerky & Snacks is made in its own USDA inspected facility. This "Carolina Reaper" variety won an award at the 2017 ZestFest Fiery Food Challenge. It's described as "gluten free", and comes with the warning, "dangerously hot!". The first flavors that hit the tongue is the Carolina Reaper flavor, followed quickly by a high degree of burn. There's a light sweet and light touches of salt. The chewing brings on the soy sauce, and some noticeable garlic and onion. The burn get more intense. For being advertised as "Carolina Reaper" it holds up really well. I get a lot of the Carolina Reaper flavor and a ton of heat. This rates as "hot" on our heat scale (level 5 out of 5). It's so hot, it makes me cough. My eyes water, my scalp sweats, my nose runs. This is whole muscle masochism at its finest. Otherwise, the primary tastes profile is a lightly sweetened soy sauce heavily laden with the flavor of Carolina Reaper chile peppers and dashes of garlic and onion. The meat consistency looks great with its light marbleized streaks of fat. It's a mixture of slices, some thicker and softer, others thinner and chewier. On average, it's easy to chew through. The chewing texture is good. It starts out a little gummy, and a little like soft plastic. But once chewed down soft, they take on a steak-like feel. I found light amount of stringiness. 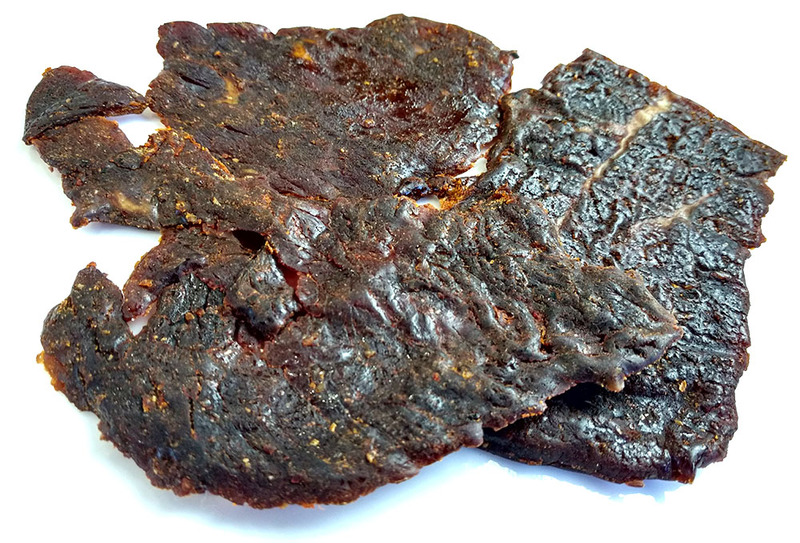 This Carolina Reaper variety from Katie's Beef Jerky will collect your soul and annihilate your body in a burning heap of ash with a heaping dose of the world's hottest chile pepper. It only took one healthy bite of this beef jerky to feel my blood rise in temperature and my tongue light up on fire. 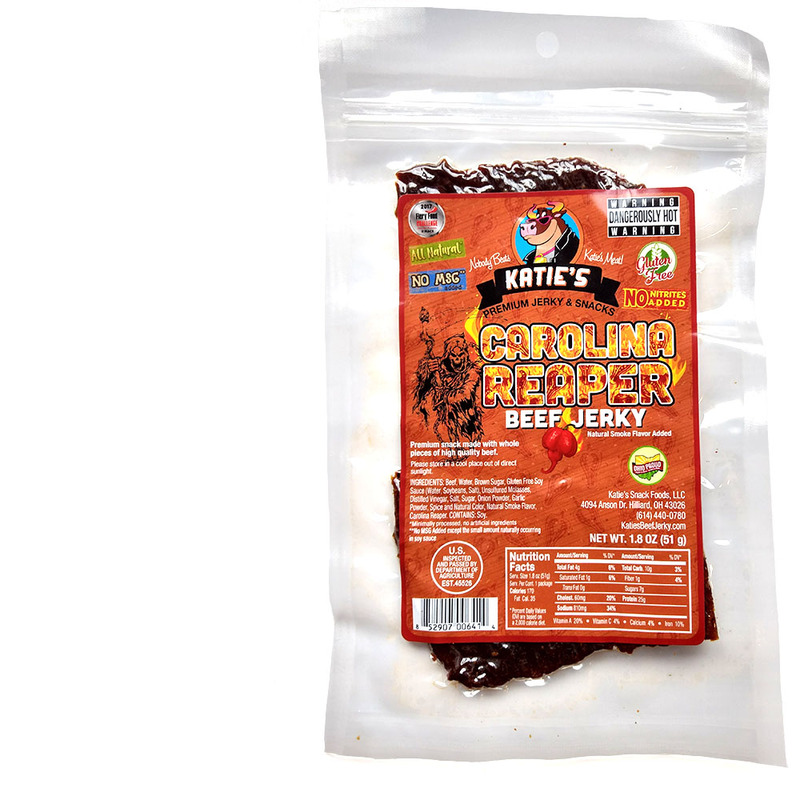 Katie's keeps the rest of the jerky toned down, yet still savory, to let the Carolina Reaper flavor show through. The meat consistency is easy to chew, allowing you to get this into your belly as fast as you'd prefer. We love a jerky that really belts out its advertised flavor, and can't help awarding this our highest honor.